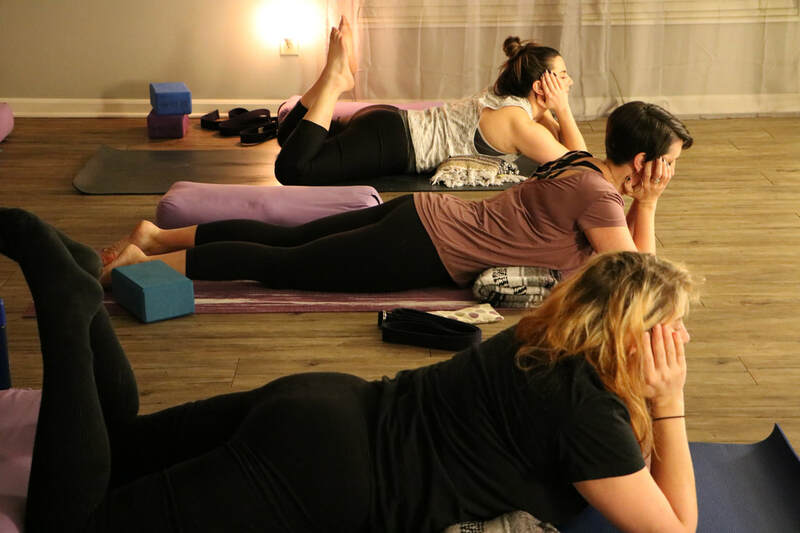 Open to all levels, a class that focuses on introducing students to a flowing (or vinyasa) practice that connects movement and breath. Beginning with an easy warm up, sun salutations, and a series of poses including balances, twists, and inversions, designed to increase flexibility, balance, and an overall sense of well-being. There will always be modifications, so you can work at the level best suited for you. Good for most levels. Using the soft candlelight, you'll flow through a yin yoga practice. Yin yoga is often described as the other half of a yoga practice. 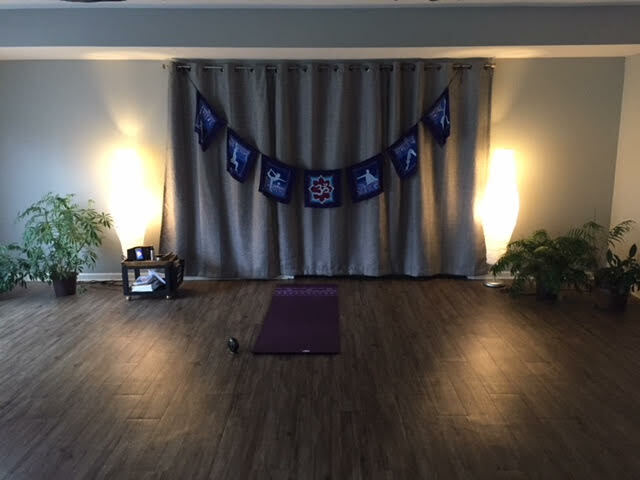 A yin yoga practice is a slower, deeper practice affecting the connective tissues of the body. Yin Yoga utilizes fewer poses during the practice, holding the pose for up to 5 minutes, it is more along the lines of a gentle practice. This class combines gentle postures, stretches, and restorative poses to increase body awareness and mindfulness skills. Appropriate for individuals who are new to yoga, have physical concerns, or would like a slower paced class. 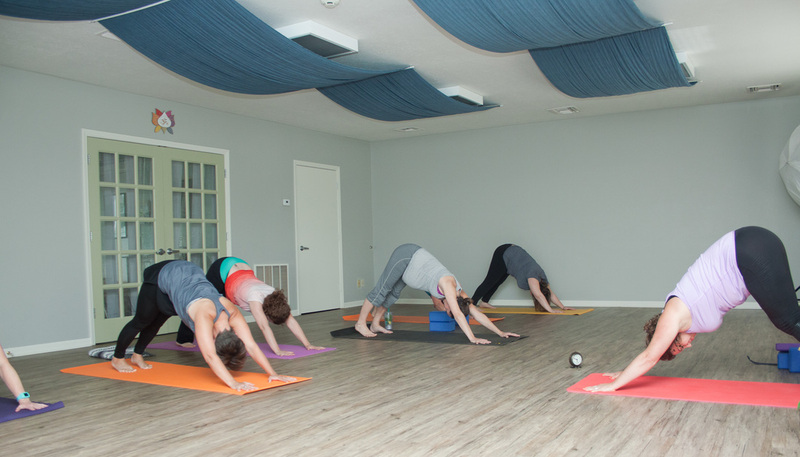 Class will focus on gentle Yoga movement and relaxation to help you unwind from your day. Classes may include a mixture of Hatha, Yin and Restorative Yoga poses, Essential Oils, Sounds Healing and iRest® meditation. 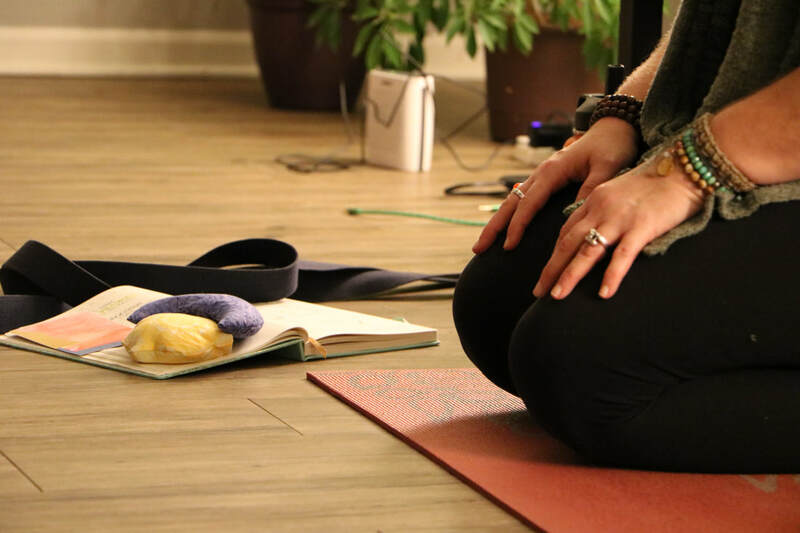 This style of Yoga is designed to help provide that physical and mental balance to prevent stress and anxiety, through the use of props that allow you to hold poses longer, giving you all the benefits of deep, passive stretching and deep relaxation. Reiki may also be requested if students are interested. No Yoga experience needed. Join us for a weekly celebration of yoga’s spiritual dimension where the definitions of sanctuary meet yoga’s union of mind, body, and spirit. 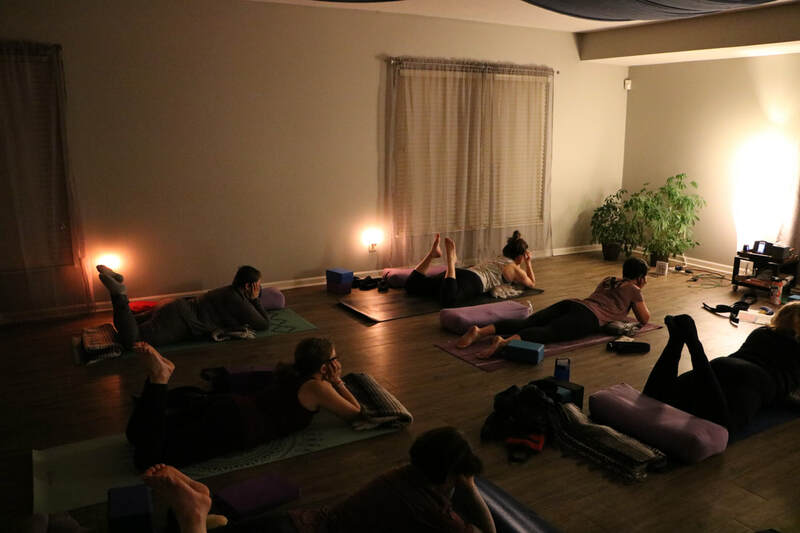 Sanctuary Yoga seeks to provide an open, safe and supportive environment where every body and soul is encouraged to explore life’s spiritual dimension through reflections, meditation, breathing exercises and the physical practice of yoga. All levels of yoga and spiritual development are welcome! Ignite and inspire yourself and those around you! Class is designed for all levels of yoga students, come prepared to have some fun, laugh, rock out to all genres of music, but get a serious workout. Class is constructed to build strength and less about extreme flexibility, it will challenge you but modifications will be offered for all levels of practitioner's. So come have fun, choose to challenge yourself or not, but you will walk away with a smile on your face and feel invigorated. In the ancient wisdom and contemplative traditions, three major centers of “intelligence” (body/movement, heart/connection, and head/insight) has been identified. True spiritual awakening occurs on all these centers, with a balanced and wholistic effect, that is grounded in daily life. With this view in mind, meditative practices of wondering ancient sufi Darvishes of Persia, and Shakti school of classical Tantra will be practiced in our meditation sessions. These meditative practices could include; Breathing techniques, visualization, different forms of chanting, dancing, whirling, movement and silent meditation. Attempts will be made to working with all the 3 centers in each session. Qigong can be described as a mind-body-spirit practice that improves one's mental and physical health by integrating posture, movement, breathing technique, self-massage, sound, and focused intent. There are likely thousands of qigong styles, schools, traditions, forms, and lineages, each with practical applications and different theories about Qi (“subtle breath” or “vital energy”) and Gong (“skill cultivated through steady practice”). The mission of the National Qigong Association is to help each individual find a path that best supports their personal goals, and to evolve this amazing energetic science. Qigong opens the flow of energy in meridians used in acupuncture and Chinese medicine. It enhances our ability to feel the Life Force underlying the physical world and to deepen our communication with it. Physically, slow gentle qigong movements warm tendons, ligaments, and muscles; tonify vital organs and connective tissue; and promote circulation of body fluids (blood, synovial, lymph). Thousands of studies have shown qigong effective in helping to heal life challenges ranging from high blood pressure and chronic illness to emotional frustration, mental stress, and spiritual crisis. *Class will not involve movement, Restorative poses will be suggested for your maximum relaxation during class. *Dress comfortably and bring an extra layer and socks for your comfort. *Props will be provided unless you’d like to bring your own. 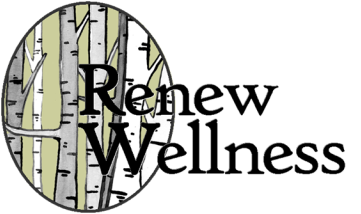 iRest stands for Integrative Restoration. Based on the ancient teachings of meditation, iRest is an evidence-based transformative practice that leads to psychological, physical, and spiritual healing and well-being. Its practice is integrative as it heals the various unresolved issues and traumas that are present in your body and mind, and restorative as it enables you to recognize your innate peace of mind that is always present amidst all changing circumstances of life. iRest provides you with tools to help you relax deeply, release stress, increase resiliency, improve your interpersonal relationships and provide you with greater mastery and control in your life. iRest nourishes noble qualities such as joy, peacefulness, empathy, forgiveness, patience and loving kindness toward yourself and others, and supports you to resolve issues such as insomnia, anxiety, fear and depression. Please visit www.irest.us for more information about iRest. Integrative Restoration iRest® Yoga Nidra ©IRI All Rights Reserved. We will be exploring principles and practices of ancient and classical tantra. 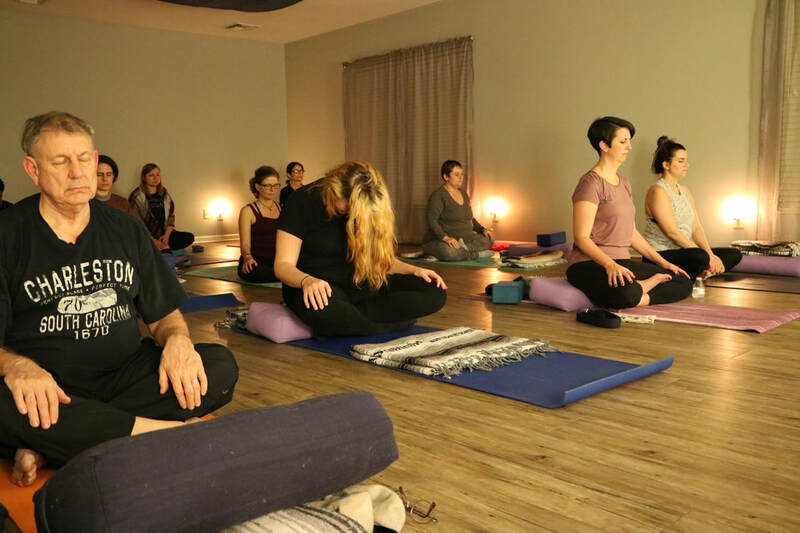 The objective of these gatherings is to help people connect to different aspects of their being that could include their body, energetic, or spiritual selves. In this group, we will practice non-sexual techniques of tantra which would inlude meditative breathing and energetic body based techniques of ancient tantra.Typically, within our gathering, we are practicing two different tantric techniques which could involve pranayama breathing or opening chakra centers toward a spiritual experience. In this gathering, we will discuss the history and principles of ancient tantra practices. Typically, within our gathering, we are practicing two different tantric techniques which could involve pranayama breathing or opening chakra centers toward a spiritual experience. Please bring a pillow, if desired, to sit upon.